Buy Felco pruning saw: <br><ul><strong><li>Taper ground teeth for knife-edge sharpness </li><li>Compact folding blade</li><li>Resistant to clogging</li></strong></ul><br>Lightweight but tough and incredibly sharp, this folding pruning saw from Felco is the perfect go-to tool for cutting in restricted spaces.<br><br>The high carbon chrome plated steel blade gives a clean cut through branches up to 8.8cm (3.5in) thick, while its 35cm total length makes it easy to manoeuvre in fiddly spaces. 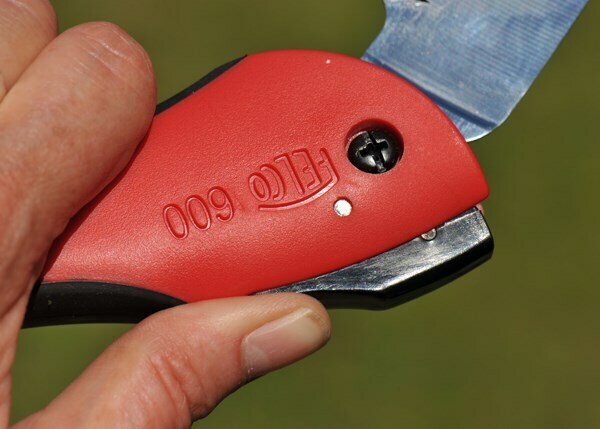 The pull action also gives you precise control over each stroke to achieve a neater finish.<br><br>The individually ground teeth ensure knife-edge sharpness and their unique shape - thicker at the base than the top - means they’re the only part of the blade in contact with the branch, preventing clogging.<br><br> Ideal for cutting small branches that are too thick for loppers, and tackling the middle of shrubs where full-size saws can’t reach. 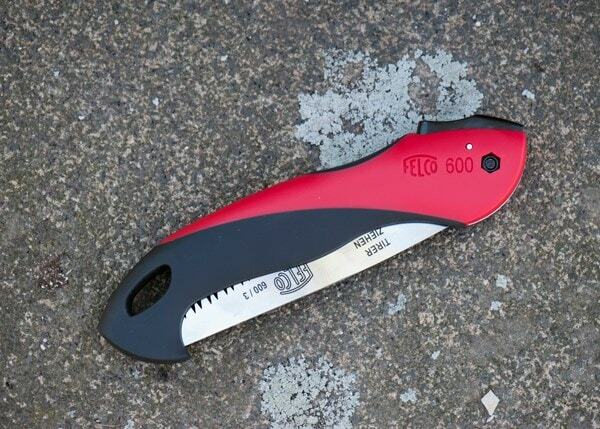 Lightweight but tough and incredibly sharp, this folding pruning saw from Felco is the perfect go-to tool for cutting in restricted spaces. The high carbon chrome plated steel blade gives a clean cut through branches up to 8.8cm (3.5in) thick, while its 35cm total length makes it easy to manoeuvre in fiddly spaces. The pull action also gives you precise control over each stroke to achieve a neater finish. The individually ground teeth ensure knife-edge sharpness and their unique shape - thicker at the base than the top - means they’re the only part of the blade in contact with the branch, preventing clogging. Ideal for cutting small branches that are too thick for loppers, and tackling the middle of shrubs where full-size saws can’t reach. Bought this as a present for my husband. Very useful for pruning shrubs and small trees. How do I prune my rose? I have a rose but I don't know how to prune it - can you advise? Rose pruning can seem bewildering when you're new to gardening. But it's really simple once you know why you're doing it and what type of rose you are tackling. The reason roses need pruning is to keep them shapely, healthy and flowering well. As I don't know which type of rose you have, below is a guide to all the pruning groups. All roses can be divided into four groups that have slightly different pruning requirements: bush roses including all hybrid teas and floribundas, patio roses and most standards; shrub roses, including species and old-fashioned roses as well as rose hedges; climbing roses; and rambler roses including weeping standards. What to prune now:- All bush roses, patio roses and most standards ? ?Any shrub roses and hedges that were left to produce attractive hips ? ?Any climbing roses that were left to produce attractive hips then the golden rules of pruning 1.Always use the right tools: tackle stems up to 1cm thick (1/2in) with good-quality secateurs; 1-3cm (1/2-1 1/4in) using long-handled loppers; and stems over 3cm (1 1/4in) using a pruning saw. 2.Always make sure the blades are sharp to make cuts without crushing or bruising the stems. 3.Always make sure the blades are clean to prevent the spread of diseases - wipe the blades with disinfectant after pruning out diseased wood. Traditional pruning advice dictates that each cut should be made to just above (about 3mm) an outward-facing bud using a slanting cut that helps protect the bud and shed water. However, recent research by the Royal National Rose Society amongst others has shown such precise attention to detail isn't really necessary when dealing with most roses. Pruning bush roses:- A common error made by beginners is to confuse shrub (see below) and bush roses. Bush roses includes all hybrid tea (sometimes referred to as 'large-flowered') and floribunda ('cluster-flowered') roses, as well as patio roses and rose varieties grown as standards. These should be pruned in late winter or early spring when the weather is not too frosty. Newly planted bush roses should be cut back to within 15cm (6in) of ground level after planting. Thereafter prune your roses hard back each year reducing stems to within 30cm (12in) of the base, or at the most to around knee height. Aim to keep the centre of the bush uncluttered by cutting out all the dead and diseased stems first, as well as any that are spindly and overcrowding. A quick method of pruning using secateurs, shears, or even a hedgetrimmer is gaining in popularity with busy gardeners. With this method you simply reduce all the stems back roughly (not worrying about cutting above a bud) to 30-45cm (12-18in). It seems that the plants don't suffer - at least in the short term - and such rough treatment increases flower production the following year. Standard roses are just bush roses on a leg and should be treated as such when pruning. Cut them back during late winter or early spring, reducing the main framework of stems by about one-third, and thin out side-shoots that are becoming congested. However, weeping standards should be pruned after flowering like rambler roses (see below). Patio roses don't need much pruning at all. If they get too big give them a general trim, removing any dead stems while you're at it. Pruning bush roses step-by-step 1.Remove all dead, diseased and weak growth. 2.If the plant is still congested select the framework of four or five well-spaced young vigorous stems you wish to keep that will create a neat cup-shaped arrangement once pruned. Remove any unwanted older stems. 3.Prune back the selected framework to within 45cm (18in) of the ground, cutting to just above an outward-facing bud using a slanting cut. Pruning shrub roses:- Shrub roses, which include the species and old-fashioned roses, should be pruned after flowering. Newly planted specimens do not require pruning other than removing broken and diseased stems. Thereafter, it's not so much pruning as long-deadheading really. Simply cut back each stem with its fading bloom with 15-20cm (6-8in) of stem attached. This will keep the plants compact and shapely. It's also worth removing old and flowerless stems right back to a younger side-shoot lower down. Old, neglected plants that have been allowed to become leggy should have a few of their oldest stems cut right back to within 15cm (6in) of the ground to encourage new shoots to be produced from the base. Shrub roses grown as informal hedges can be pruned in the same way to maintain dense growth, or use a hedgetrimmer after flowering is over if you want a more formal look. Bear in mind that any shrub roses grown for their hips should not be pruned until winter or early spring. Pruning climbing roses:- Climbing roses can be divided into two groups: those that bloom all in one go during early summer and the rest which flower more than once, sometimes on and off all summer long. Those in the once-flowering group produce flowers on old wood and should be pruned after flowering. First remove all diseased and dead wood. Then, prune vigorous plants hard by removing one in three of the main stems starting with the oldest. Cut them back to a newer sideshoot produced lower down. Finally, trim back the flowered sideshoots on all the stems that are left to within two or three buds of the main framework. Less vigorous varieties are best deadheaded only. Repeat-flowering climbing roses bear their flowers on short sideshoots produced during the current season on an established framework of branches. Pruning is not normally necessary although regular deadhead where practical will improve the display. However, if they are being grown for their attractive hips any trimming should be left until winter or early spring. Then, cut back the flowered sideshoots on all the stems to within two or three buds of the main framework. Pruning rambler roses:- All ramblers produce a single flush of flowers in summer. The flowers are borne on growth that was produced last year. Most will readily produce vigorous young shoots from the base forming an impenetrable thicket if left unpruned. To keep ramblers accessible and blooming well it is worth thinning out one-in-three stems after flowering starting with the oldest. Cut back to within 7-10cm (2-3in) of the main framework or to ground level. If there are insufficient new stems, cut back the older stems to a newer sideshoot near the base of the plant. Less vigorous varieties are best simply deadheaded. Weeping standard roses are produced by budding a rambler on top of an upright stem. These should be pruned after flowering by shortening the oldest main stems to a newer shoot nearer the crown and thin out side-shoots that are becoming congested. Pruning groundcover roses:- With groundcover roses the aim is to get a thick carpet of flowering stems. Pruning is, therefore, usually unnecessary except to remove unwanted upright growths. Use a pair of shears or a hedgetrimmer for a speedy trim. Aftercare:- Clear away all prunings to prevent carryover of disease. With standards, climbers and ramblers check ties and supports and adjust or replace as necessary. Feed after pruning in early spring by applying a proprietary rose fertiliser at the recommended rate over the ground around roses. This will encourage vigorous disease-resistant new growth. Mulch the soil with a 5-7cm (2-3in) layer of well-rotted organic matter taking care not to pile the material against the plants' stems.